2. Download API wrapper to set up API connection. If you are using SPMT relay or modules this point does not apply. Here you can set up your SMTP messages. If you are using SMTP relay or modules this point does not apply. 4. Go to Settings & Tools section. There start with authenticating your sender email domain. To authenticate your domain click on Sending Domains. Authenticate your domain by the example given on that page. Read more in our support topic "How to verify sender email/domain?" After that set up Webhooks to receive messages if person unsubscribes, bounces etc. Read more about webhooks in our support topic "How can I set up Wbhooks?" 5. Create a message that you want to send. When you are ready to send do not forget to include signing domain. Read more in our support topic "Why can't I send emails if my domain is verified?" 2. How to verify sender email/domain? To verify your sender email domain go to Settings & Tools section and click on Sending domains. On the right hand side you will see the field where you can add your domain. After you have entered your domain go to your hosting domain management panel section to add 2 DNS records with TXT types: SPF and DKIM/domain keys. The example of records that has to be added in your host panel are on the top of the page. Note: When you are entering the example records make sure that you have replaced entry "yourdomain.com" with domain of your own. Complete the authentication and verify your domain by sending yourself a test email. You can do that on the right hand side by clicking on verify domain link. Note: The correct way to authenticate domain is to add domain name without www in front of the domain. Enter only exampledomain.com part. 3. Why can't I send emails if my domain is verified? This information is available in our API documentation page, where you need to add sender domain. Search for "signing_domain". Note: You can type in the email domain that you have verified during authentication. 4. Why do I get error code 10? This error code appears when the from name and email values are missing. If you are using API method messagesSendRaw, then in the "From" field you need to specify "raw" dynamic part, and it must be a part of the raw code. 5. Why do I see code 37? Can I send email from public domains? Using LeaderSend system, emails can be sent only by using authenticated domain email addresses. Transactional emails that are sent, e.g. confirmation emails, invoices etc, sender must be recognizable. Therefore only authenticated email domains are accepted. 6. Why do I see that my account is suspended or paused? Every client that signs up for an account with LeaderSend must undergo account verification. This enables us to keep the spammers from using LeaderSend and hurting the legitimate companies who employ the system to send transactional emails to their contacts. Verification questions will be sent to you after first 50 emails are sent. Please reply to the email sent, so our verification team could check your account ASAP. After we review your account and it is verified the emails will continue to send out. There could be occasions when account is not verified. In that case our team member will contact you personally. If you haven't heard from us within 24h, just connect with us via email support@leadersend.com one more time. Usually you will hear from our team within couple hours if we have some additional questions regarding your account. 7. How can I set up Webhooks? To set up triggers for webhooks first read Webhooks documentation page. Than click on Settings & Tools, you can see that menu option on the left hand side in your account. After that click on Webhooks. A window will appear where you need to add an API key. After API key is added set up triggers needed. If you are integrating another platform, e.g., CRM, eCommerce, CMS system you can use API to connect LeaderSend to that platform. Here is API documentation. 8. How to start sending via SMTP relay? Open your email program and in its settings (the placement of those settings differ by the program you use) add SMTP credentials seen in the LeaderSend account. You will need a password as well, it will be API key that you need to create. And you can create it by clicking on "Add New+" button. Copy the API key and paste it where password is needed. When you will complete necessary steps to set up SMTP sending rely you can send emails easily. And they will be sent via LeaderSend. 9. What is transactional email? Transactional emails are system generated emails like invoices, delivery notifications, social media announcements, service renewal messages, confirmation emails, password renewals, approvals etc. Every email that is user trigger based. Read more in our blog article "What Is a Transactional Email?" 10. How Do I Send With PHPMailer? Additional examples for using PHPMailer can be found in the PHPMailer examples folder with the PHPMailer source. 11. How to connect ProjectManager and Leadersend? 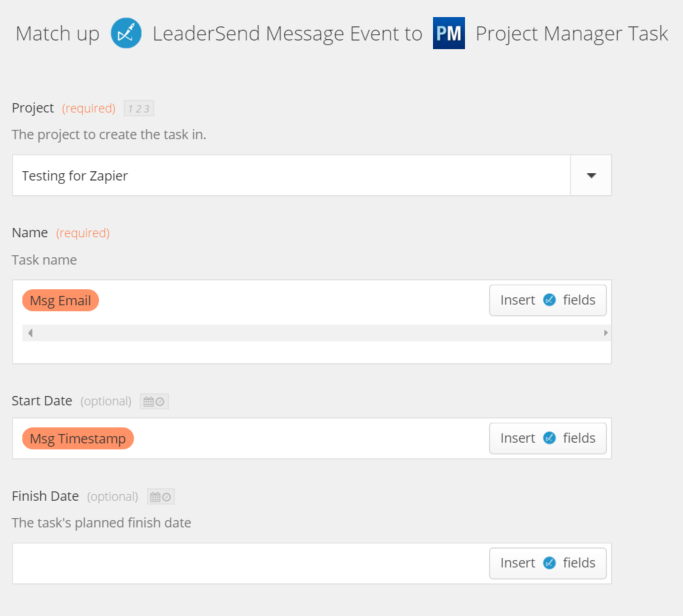 LeaderSend just got more powerful with its ProjectManager.com integration. Bridged by Zapier, you can now send transactional emails via API or SMTP and track opens, clicks, bounces and even create webhooks to follow up on soft bounces, hard bounces, reject, and spam filter events. This way your team can set up triggers to reach out to new lead or customers automatically. Adding a personal touch can encourage your customers to give you the correct contact information so they receive your transaction emails. The following is a guide to set up the LeaderSend and ProjectManager.com integration. 1: Log into your Zapier account. 2: Locate and click “Make a Zap!” in the navigation bar within Zapier. 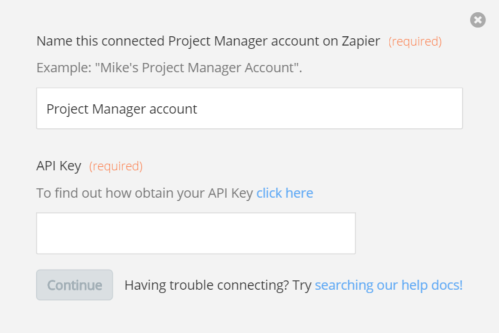 4: Connect your LeaderSend account to Zapier. Follow the directions found below your trigger settings. *Note: make sure to use the web hook link that Zapier gives you. The one above is an example. 9: Name your Zap and turn it on. If you do not turn on your Zap then it will not work!